I’m still thinking about my Mexican adventure last Spring which is beginning to feel like a distant memory… But, if you find yourself in Tulum, you must make time to explore the Si’an Ka’an Biosphere Reserve, which is an amazingly beautiful UNESCO World Natural Heritage Site that is located on the east coast of the Yucatán peninsula. It is full of natural wonders: tropical forests, mangroves and marshes, and a large marine section intersected by a barrier reef. 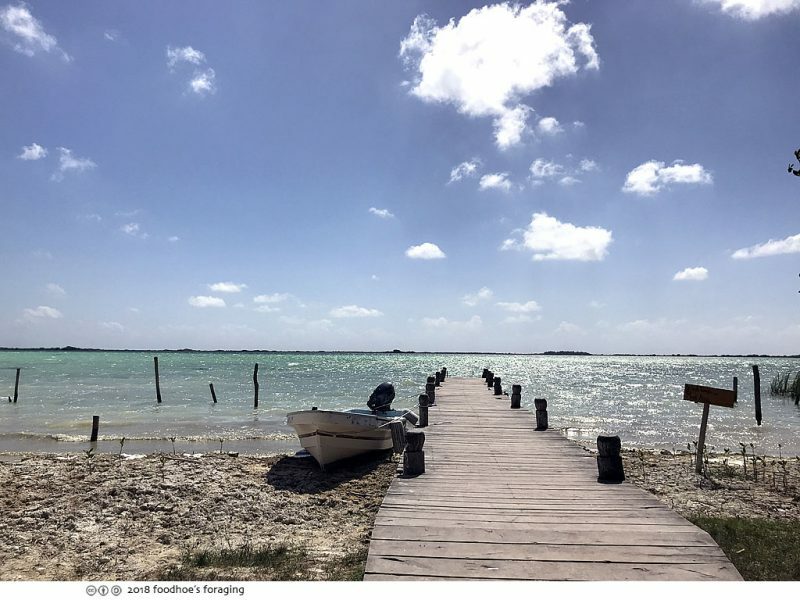 Sian Ka’an in Mayan translates to Where the Sky Begins and you totally feel it with the vast expanse of sky that surrounds you! 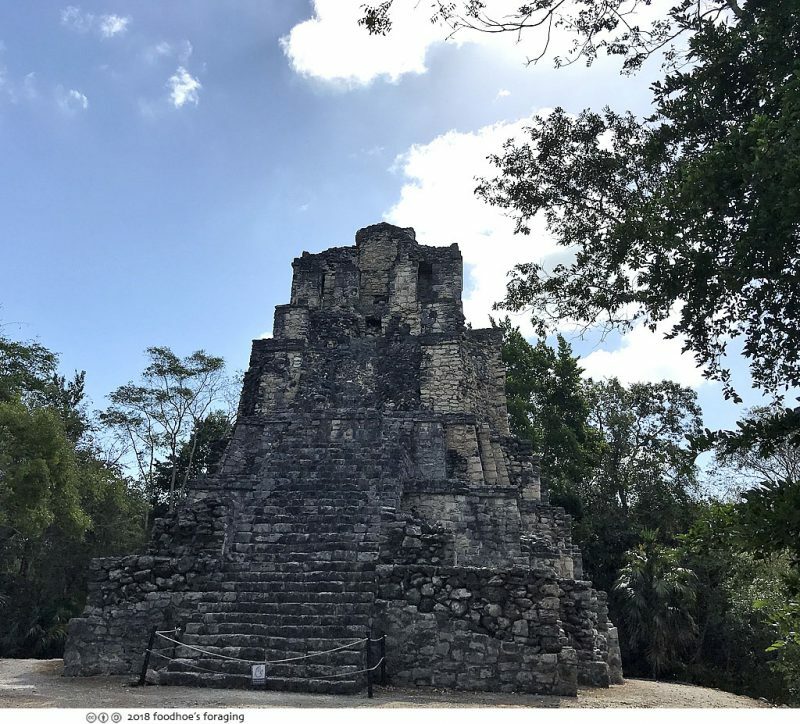 We explored walkways through the protected jungle preserves and mayan ruins with our guide who told us about the Maya: a rich, complex society full of astronomers, mathematicians, agronomists, philosophers, artists, architects, sculptors and warriors, whose history is really fascinating. They were the first to cultivate chocolate, chilli peppers, vanilla, papayas and pineapples. They built causeways and reservoirs, created great works of sculpture and art, carved fantastic jade masks and wove rich colorful textiles. They also developed sophisticated mathematical systems; complex, accurate calendars; and perfectly proportioned buildings of immense size and beauty. 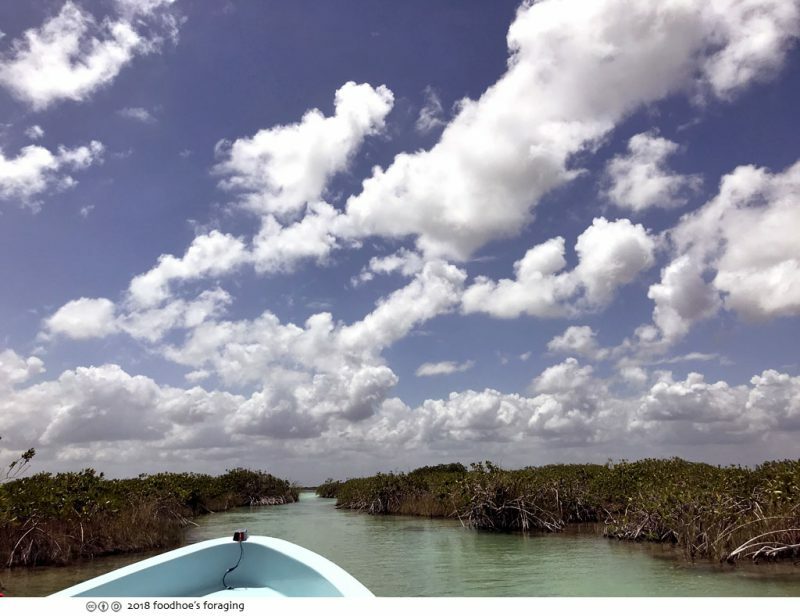 After the hike through the jungle, we went on a boat ride across the crystal clear azure waters of the Caribbean Sea, until we got to the canals where we floated down ancient maritime canals, hand-dredged by Mayans nearly 1200 years ago. After exploring the past, we ventured into the stylish section of Tulum, along the beach where you find the beautiful people, boho-eco chic urbanites seeking world-class restaurants with phenomenal cocktail programs in a jungle setting. 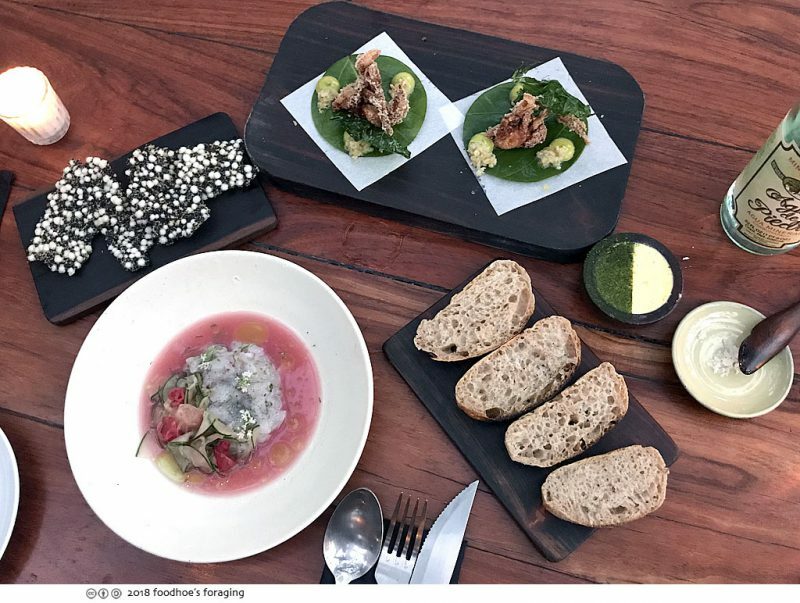 It’s full of yoga on the beach, juice bars and vegan friendly cafes, and expensive boutiques, but there are also many restaurants where the chefs focus on the spectacular local ingredients, wood-fired cooking heavily influenced by the nearby ocean and tropical environs. It’s definitely the place to be and I failed to get a reservation at Hartwood, which is the restaurant that started the fascination with Tulum, so we opted to go to Arca next door where it is still possible to get a table without reservations! The chef Jose Luis Hinostroza is the California-raised son of a Mexican family, who worked at the illustrious Alinea in Chicago, El Cellar de Can Roca in Spain then at Noma in Copenhagen. From Noma, he went to Tulum to spearhead Rene Redzepi’s Noma Mexico pop up last year (May 2017) and then stayed to become a partner at Arca. 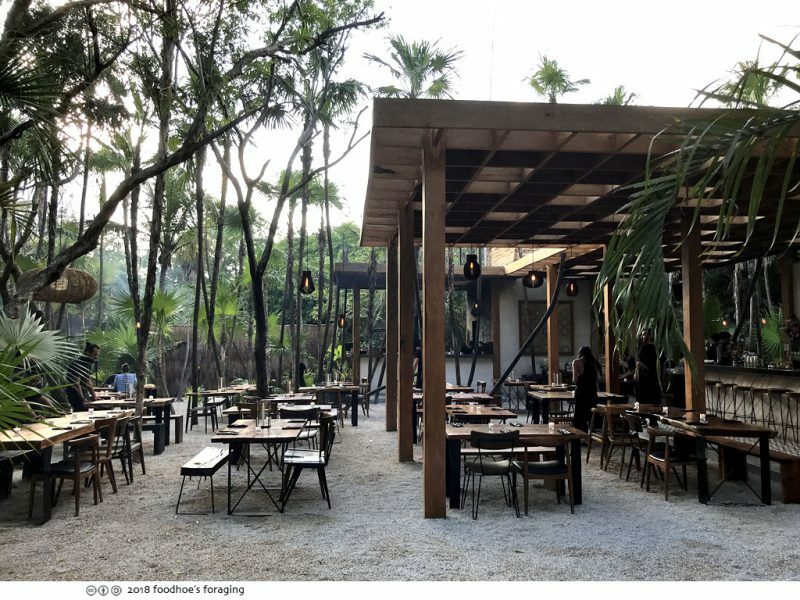 It’s open air dining at its best, everyone is seated at modern picnic tables surrounded by the lush jungle with lanterns dangling overhead from the trees and a wooden framework that provides minimal shelter above. There’s a fragrant waft from copal resin, an incense they burn to try to keep the mosquitoes at bay. We got there before they opened and stood in line to get our names on the wait list and then sat at the bar until a table was ready. 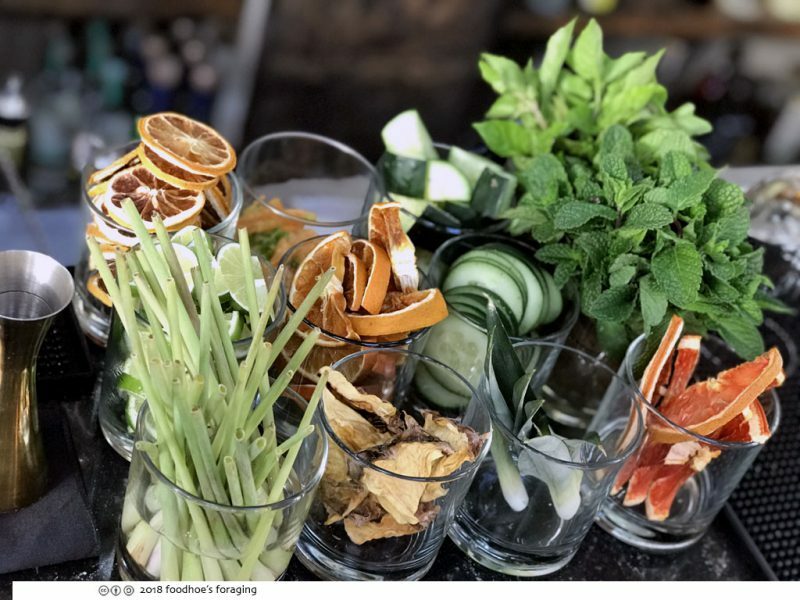 You can just tell from this spread that great artistry is involved with the making of cocktails at this bar! 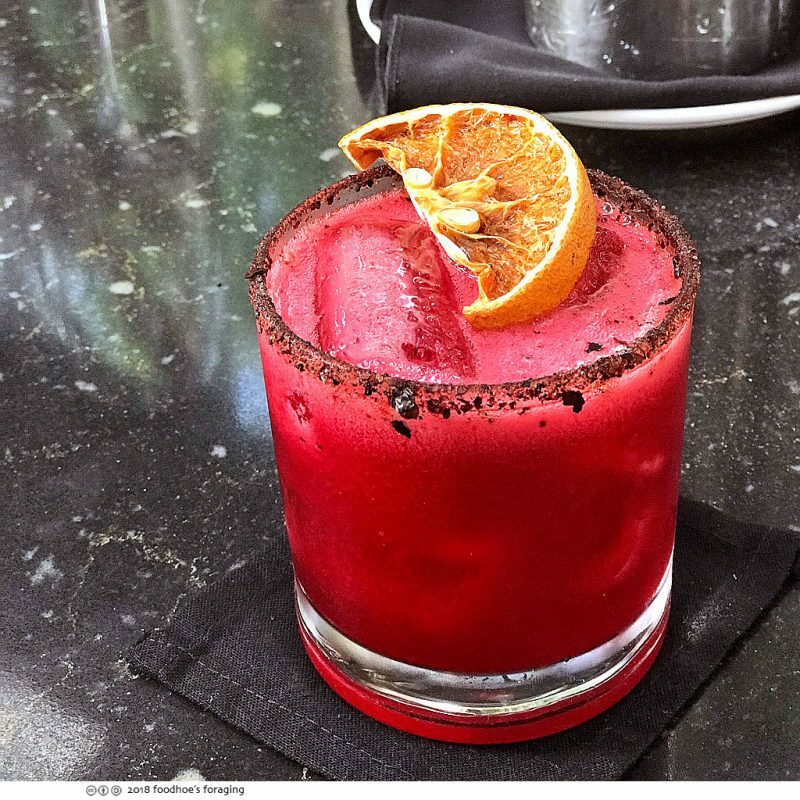 Mr. K had the El Solar, the pink cocktail had a dark smoky flavor and was made with mezcal, hibiscus, piloncillo, chipotle syrup, smoked ancho chili rim and garnished with a dehydrated citrus. We waited about 20 minutes before we were seated and ended up ordering a bunch of small plates to share. All of the dishes arrived at once. 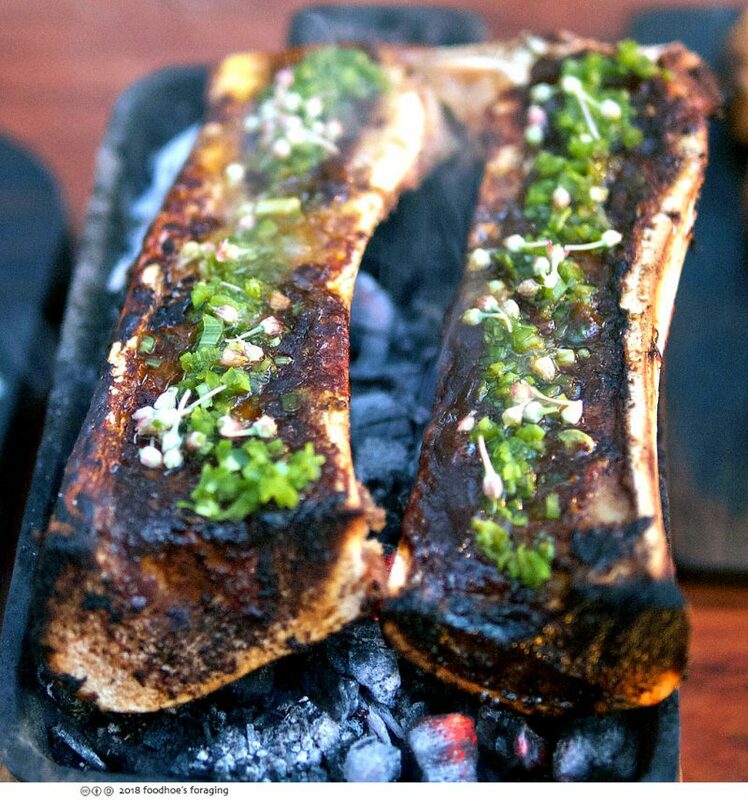 We were served huge flintstonian marrow bones drenched in a delicious tamarind and papilla glaze, topped with charred scallion salsa, pickled onion flowers, served with grilled bread. 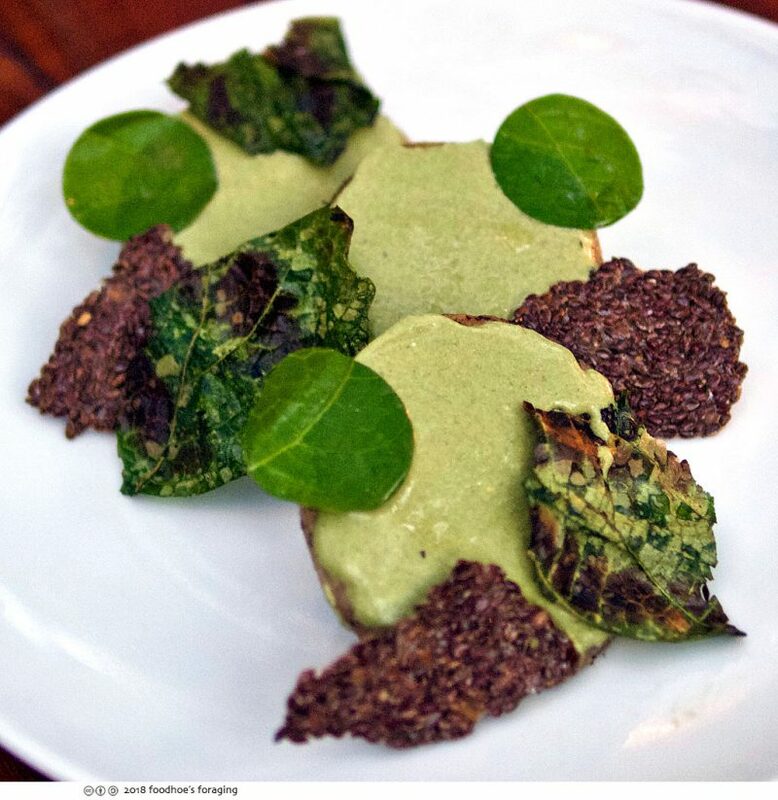 We loved how the pungent fresh herby topping melted into the rich fatty marrow, and it was so fantastic spread on the savory grilled bread. 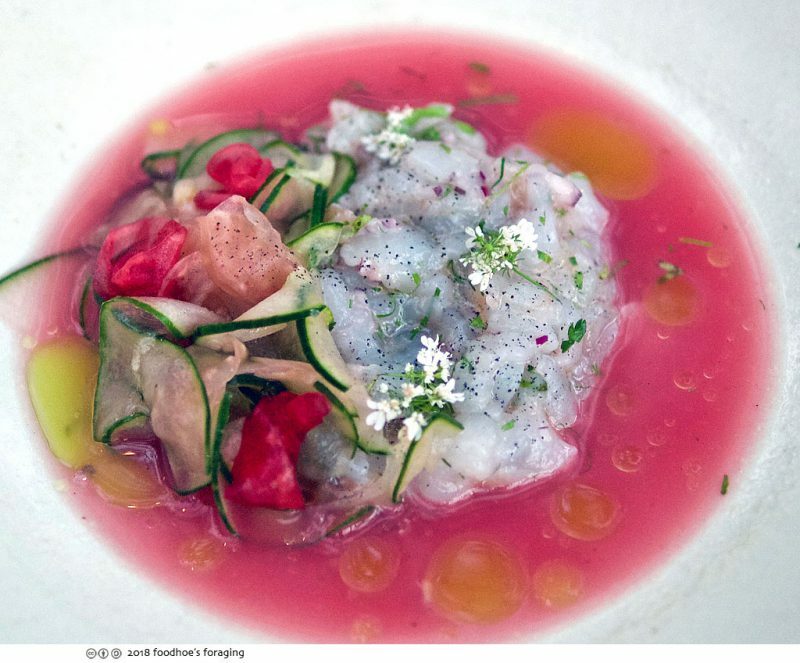 Citrus-less prawn ceviche, pickled cucumber, yoconostle and hibiscus aguachile, coriander oil, charred habanero powder. Fresh bright and clean flavors. 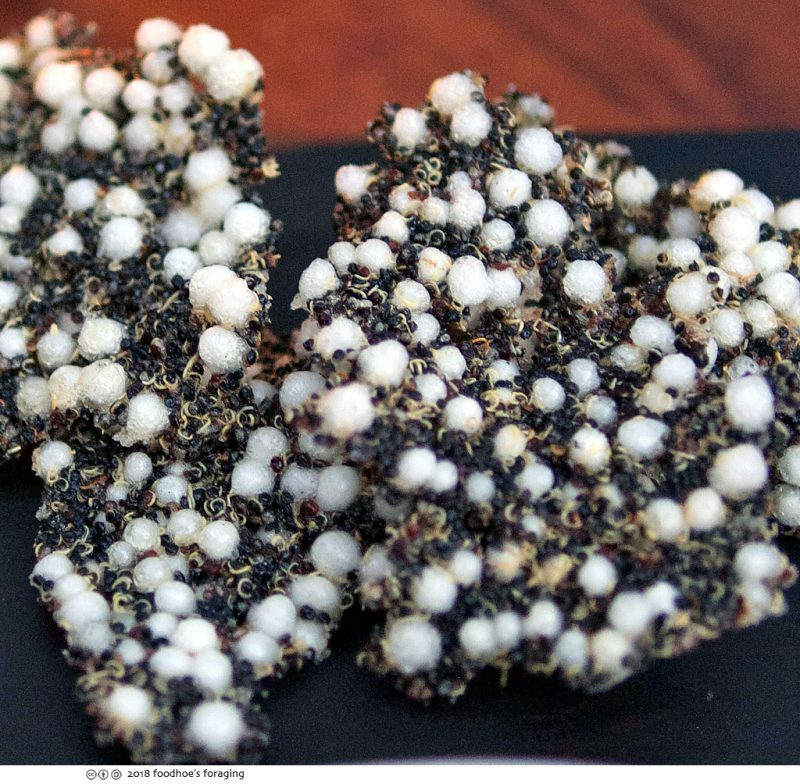 The ceviche was served with a crispy cracker made with black quinoa and tapioca that was dramatically beautiful and elegant and tasted very good too. 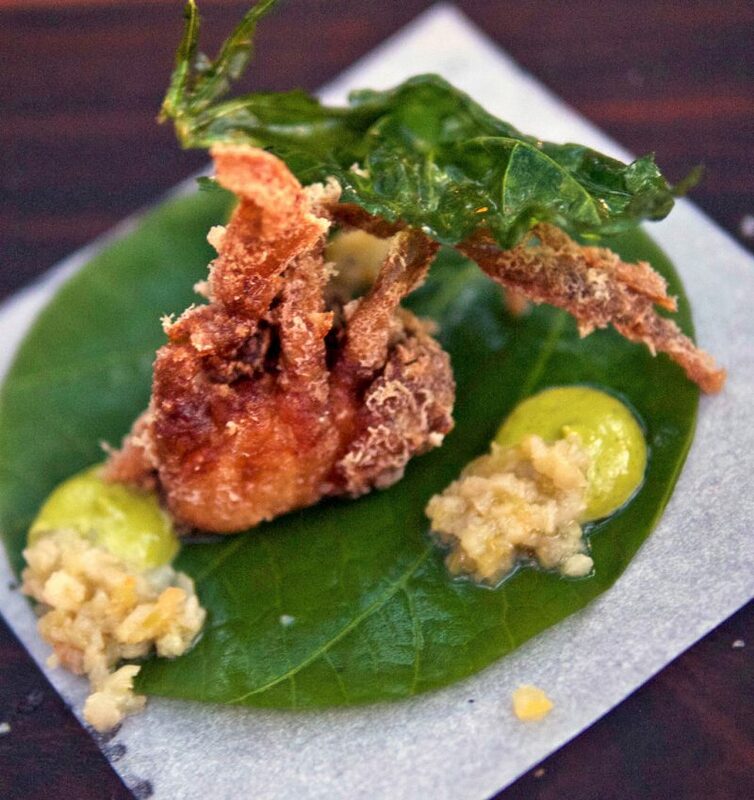 We shared two orders of tacos made with fried soft shell crab, amaranth, tempura, rosella and pickled habanero salsa, chaya emulsion, fried chaya and chaya powder. These were quite small, the leaf wraps were made from the pepper plant and probably 3 inches across. 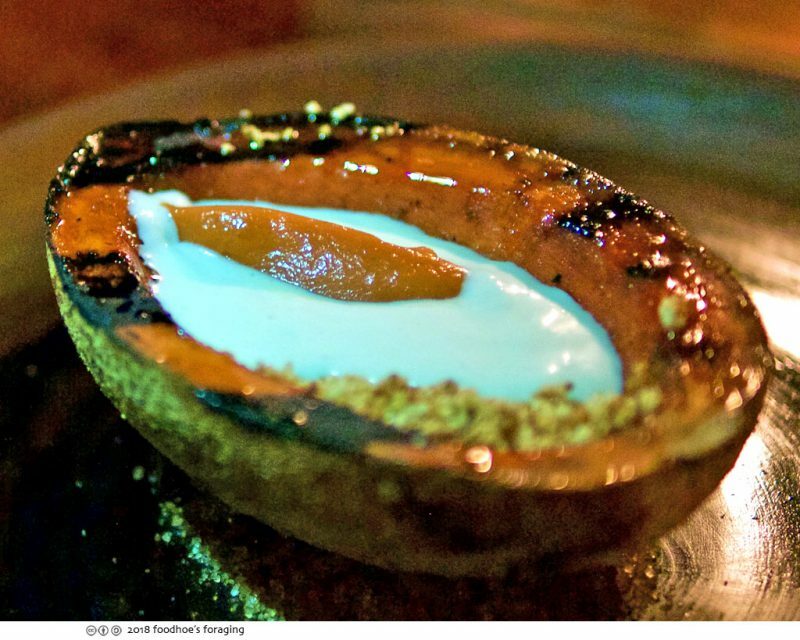 I was beginning to feel the effects of a long day exploring (and as it turns out I ended up with chills and a fever by the time we got back to our AirBnB), so we did not order any entrees and finished our meal with a roasted Mamey squash filled with sweet rich custard and topped with caramelized nuts. It was small and sweet and a perfect ending to the meal. Tulum is totally magical, we can’t wait to come back!